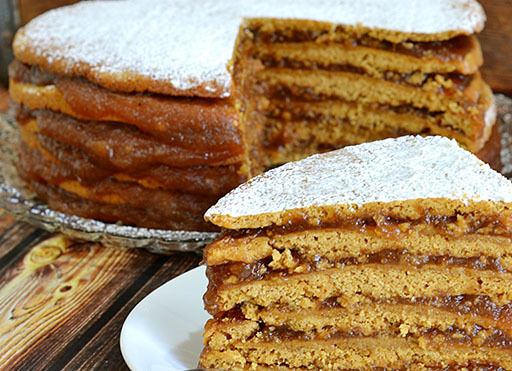 There are many different versions of Stack Cake out there, this one is more like the “old fashioned” style that used to be used in southern mountain towns. There is actually a little bit of history that goes with these cakes, which is kind of neat. Cakes used to be (and still can be) quite expensive. So when small towns would have town gatherings, like a barn dance, each family would make and bring one layer of a cake and it would be assembled (or stacked) using dry spiced fruit or apple butter. These Stack Cakes became a tradition in many small mountain towns in the 1800’s, and recipes have been passed down for generations in many families. We thought this kind of cake would be a fun one to share for our dexterity game episode because in many dexterity games, there is a stacking element. So this Stack Cake fit into the theme in a fun way. Make one to serve at your next gaming get together, or encourage each of your friends to make a layer and you can even make a game out of stacking the cake! Whatever you do, if you decide to make this cake…please send us picture or post them on social media and tag us!!! Line bottoms of pans with parchment paper, and spray parchment paper with nonstick cooking spray. Beat shortening and sugar until creamy. Add buttermilk, molasses, egg, and vanilla, beating well. In a medium bowl; combine flour, ginger, baking soda, salt, cinnamon and nutmeg. Slowly add the flour mixture to the wet mixture; mix until combined. On a lightly floured surface, form dough into a log; cut into 6 equal portions. Place 1 portion in each prepared pan, and use finger to lightly pat dough to edges of pans. NOTE: This dough is more like cookie dough than it is like cake batter. Repeat with remaining layers and fruit butter filling, stacking each on previous layer. Do not spread fruit butter filling on top layer. Cover and refrigerate cake for at least 24 hours. You can make your own, using this wonderful recipe from Lady Behind the Curtain (http://www.ladybehindthecurtain.com/slow-cooker-apple-butter/) OR buy your favorite jar or Apple Butter from the store (This is what Jondi has done).